3xLOGIC, Inc., a leading provider of integrated intelligent security solutions and partner Sonitrol Tri-County, today announced that together they will be working to boost security at Flint’s City Hall with a donation of high-tech, high-resolution video surveillance cameras, related recording equipment, accessories, and on-site installation at Flint City Hall. The entire project is valued at approximately $70,000 in donated equipment and labor. 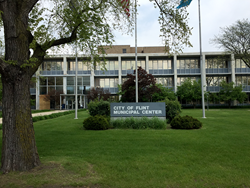 Flint City Police recently approached Sonitrol Tri-County for assistance in increasing security at City Hall. Sonitrol then contacted 3xLOGIC, Sonitrol technology innovator and developer, for its help. After a short consultation, the two firms agreed to a speedy, joint donation. Under the agreement, 3xLOGIC will be supplying $50,000 worth of security cameras and related surveillance equipment, and Sonitrol Tri-County will provide total package installation and necessary cabling, valued at approximately $20,000. System installation at City Hall is scheduled to begin around mid-May, 2016. As one of the nation’s largest commercial security companies, Sonitrol offers integrated security solutions, featuring a unique verified audio detection technology. Sonitrol provides businesses with a single source of state-of-the-art alarms for verified audio and video intrusion, as well as video surveillance, access control and fire detection, all backed with professional monitoring by experienced, trained personnel. Sonitrol Tri-County provides Michigan businesses and other organizations with a single source of integrated, state-of-the-art security solutions. Sonitrol has the best apprehension rate in the industry, and the fewest dispatches for false alarms. Sonitrol Tri-County’s regional headquarters and state-of-the-art monitoring center are located in Grand Blanc, Mich. For more information, go to http://www.sonitrolverified.com. Sue Voyles, Logos Communications, Inc.